I Have 999 Apps Downloaded; How About You? Hey guys, here’s a fun little article. I checked my iTunes library today and I saw that I had no more and no less than 999 applications. 999! I never thought that I would have that many applications, but I am 1 application away from hitting number 1,000! The App Store has changed the way we all live our daily lives and makes it super simple to get exactly what you need. Nothing has ever existed like it. This has truely helped shape the world and the future of the personal computer and mobile devices. We love the App Store. 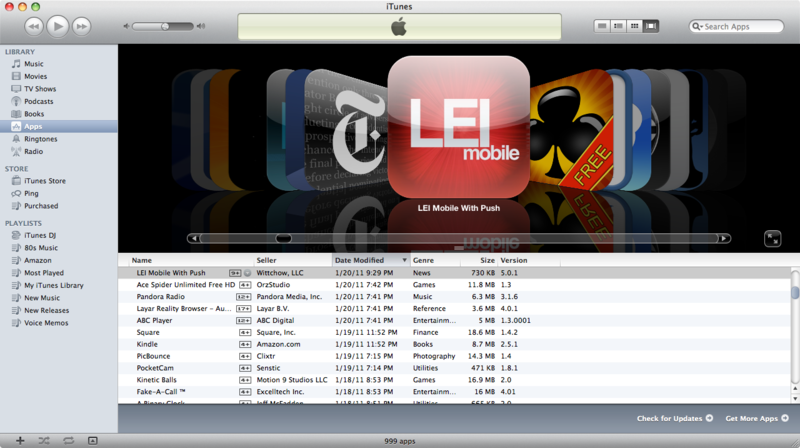 LEI Mobile has been an amazing sucess here both on Cydia and on iTunes and we couldn’t be happier. Over 115,000 downloads of LEI Mobile is astonishing. We never would have been able to get that kind of exposure on our own. Also, I was wondering, how many applications do you have? How many do you use every day? I have 262 but I’m gonna challenge you that I can get 1001 by friday! 220 on iTunes 208 on iPod. Alan hoe many are actually on your device?